I'm not sure if this link works If it does you will see a pdf page of an article by Jonathan Goldberg QC in the Jewish Chronicle. First up the headline is a bit dodgy. 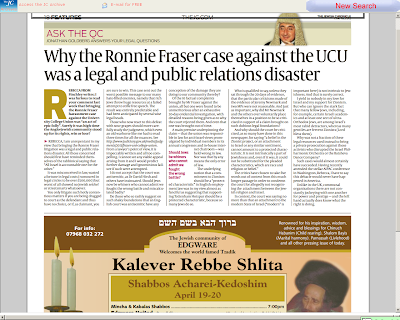 It's Why the Ronnie Fraser case against the UCU was a legal and public relations disaster". Now it wasn't simply legality and PR. It was the presentation of dubious descriptions of events and a ludicrous definition of who is a Jew and what, therefore, antisemitism or anti-Jewish racism means. In other words, the facts of the case that were against Fraser and his team. In fairness, Goldberg gets into all that so I'm guessing he didn't write the headline. I should point out that the article appeared in the same edition that carried the front page headline, Union case is 'Hitler's legacy' so the fact that it has a misleading headline and doesn't appear in the regular website presumably has something to do with JC editor, Stephen Pollard. It was misconceived in law, wasted a fortune in legal costs (rumoured in legal circles to be over £500,000) but worse of all it showed no Jewish seichel or streetsmart whatsoever. Wow! £500k? Who from? Where from? Fraser mentioned sums like £70k and £50k going from the JC's Fair Play Campaign Group to Engage and it has never really been denied definitively. There have also been online rumours of Israeli government support for "lawfare" cases in the UK but I've never seen as much as £500k mentioned before. Do those who so rashly suggest on such shaky foundations that an English court was antisemitic have any conception of the damage they are doing to our community thereby? What about points of fact and law? The underlying notion that a commitment to Zionism should be a "protected characteristic" in English employment law was in my view almost as fanciful as suggesting that supporting Tottenham Hotspur should be a protected characteristic, because so many Jews do so. ...why should the court be criticised.....for saying "a belief in the Zionist project or an attachment to Israel or any similar sentiment cannot amount to a protected characteristic. It is not intrinsically a part of Jewishness and, even if it was, it could not be substituted for the pleaded characteristics, which are race and religion or belief." In context, the court was saying no more than that an attachment to the modern State of Israel ("modern" is important here) is not intrinsic to Jewishness. And that is surely correct. ....who can ignore the stark fact that many fellow Jews, including, for example, certain Israeli academics and at least one sect of ultra-Orthodox Jews, are among Israel's most rabid detractors, whereas many gentiles are fervent zionists (Lord bless them). 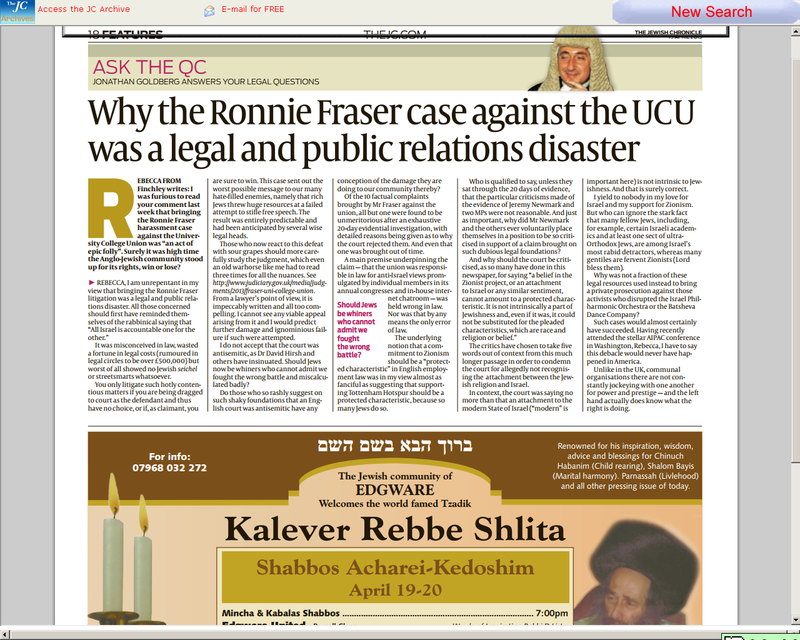 The QC then goes on to suggest legal fights that Zionists could win, like suing for disrupting Zionist events. He could be a surer ground there unless the disrupters of events can show that they are merely trying to prevent worse crimes by the racist war criminals of the State of Israel and their supporters. What clearly won't work any more is the lie that Jews are essentially Zionists and that therefore anti-Zionism is a form of racism. Jews have many different political persuasions and anti-Zionism is one of many forms of anti-racism.